Note: Won 3 of 5 starts as a juvenile, including the Breeders' Cup Juvenile Turf (G1) at Churchill Downs. 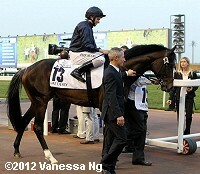 In 2012, he started the year with a third place effort in the UAE Derby (G2) at Meydan in Dubai. His owners announced on April 16 that he will not go to the Derby.